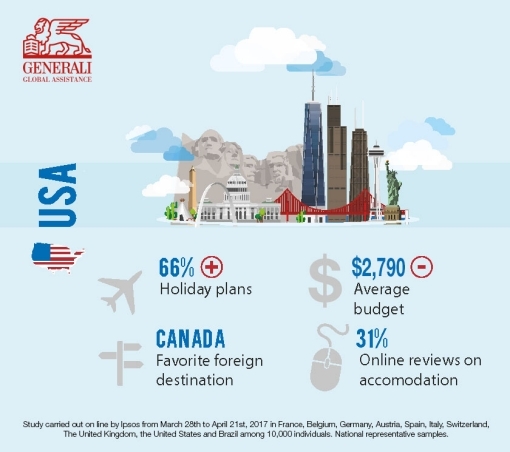 After a dip in 2016, more travelers from the U.S. and Europe will be packing their bags and heading on a vacation this summer, according to an annual consumer survey conducted by Generali Global Assistance. The survey, in its 17th year, found that 66% of Americans plan to travel this summer, up five percentage points from 2016. That compares to 63% of Europeans who will travel this summer which is an increase of nine percentage points from last year. The survey noted that although more people are travelling, they are doing so for a shorter duration. Americans will go on vacation this summer for an average of 1.4 weeks, down from 1.7 weeks in 2016. Europeans saw an even more precipitous drop from an average of 2.4 weeks in 2016 to 1.9 weeks this year. Brazilians checked in with the longest average duration in 2017 at 2.2 weeks. With budgetary constraints on the rise, travelers are unsurprisingly electing to vacation within the confines of their own borders this summer. This was especially true in France (63%), Spain (52%), and Italy (56%). By comparison, 41% of Americans said they would keep to U.S. when it came to travel this summer. The most likely to venture beyond their borders are Belgian (16%) and Swiss travelers (20%). In fact, these are the only two countries where more travelers are planning to head to a foreign country than to stay within their own this summer. While the seaside is the favorite destination of European travelers and 63%, the most sought after for U.S. travelers this summer will be urban locations at 46%. For Americans, the beach ranked number two on the list of favorite destinations at 43% followed by the mountains (46%), the countryside (24%), and touring (23%). Spain ranked as the highest in terms of European countries where travelers showed a penchant for urban travel at 43%, an increase of 16 percentage points over 2016. For Americans, Paris ranked as the top city that travelers wished to visit at least once in their lives, with New York City and London tying for second. For Europeans, the top choice was New York City with Paris and Rome rounding out the top three. Out of Office: Set it and Forget it? During vacation, Americans are the most connected to their work – only 56% will completely unplug from their job. Europeans are significantly better with 68% saying they will unplug, but that is down five percentage points from last year. Travelers from the U.K. are the best at setting work-life boundaries, as 70% will completely disconnect while on vacation. Hotel stays are still the most popular form of lodging amongst Americans (57%) and Europeans (47%) alike. However, other types of accommodations are becoming more popular with travelers. Americans are more likely to seek out free-of-charge options like staying with friends or family at 32%, compared to 22% of Europeans. However, Americans are less likely to use person-to-person rentals or exchanges at just 18%. This form of accommodation is second behind hotels for Europeans at 35% and, is actually the most preferred lodging for the French at 42% - the only group for which hotels are not the number one option. Within the rental/exchange segment, there are some differences by country. The French are the most interested in rentals of a private house or apartment from an individual, but are significantly less interested in renting a room in a private home or being part of a home exchange. Brazilians are the most likely to rent a single room in a house at 34% and Americans and the Swiss are tied in terms of utilizing home exchanges (19%). New travel practices that are more in touch with nature are also becoming more en vogue. Americans are more likely to engage in these types of adventures than their European counterparts across the board. Camping is the most popular activity for both demographics with 48% of Americans and 23% of Europeans having slept in a tent under the stars. Additionally, 40% of Americans have slept in a cabin (vs. 18% of Europeans) and 20% have gone on an eco-tourism trip designed to explore nature while minimizing harmful human impacts (vs. 13% of Europeans). Along the same lines, Americans and Brazilians are a bit more adventurous when it comes to alternative lodging choices not involving nature. For Brazilians, the practice of staying in a local’s home while travelling is widely accepted as 41% have done so compared to 30% of Americans and 24% of Europeans. The same hierarchy holds true for hosting travelers in their own homes, with 18% of Brazilians, 14% of Americans and just 7% of Europeans having engaged in that practice. Checking online reviews has become common practice among travelers on both sides of the pond. For Americans and Europeans (both 31%), online peer reviews are now the third most important factor when it comes to choosing vacation lodging. For Americans, the number one determining factor when selecting lodging is the location, while for Europeans prize value and price. Amenities and pictures of the place rank four and five respectively for both demographic segments. The 17th edition of “Summer Holiday Plans” survey was conducted by Ipsos on behalf of Europ Assistance and Generali Global Assistance between March 28 and April 21, 2017. The survey was conducted online for 10,000 consumers in 10 countries, with 1,000 consumers taking the survey per country.